Kevin became a patient at The Hospital for Sick Children (SickKids) as an infant. He was born with a hemangioma, Hemangiomas are the most common, non-cancerous growths in babies. They are caused by extra growth of cells lining the small blood vessels in the skin. Hemangiomas present with red-purple skin changes. Kevin was treated by doctors in the Department of Dermatology, as well as by plastic surgeons. He has undergone several surgical procedures through the division of craniofacial surgery, the most recent in June 2018. During the summer of 2018, Kevin’s parents noticed that his upper left arm looked considerably larger than his right. His family doctor sent Kevin for X-rays. Hours later the family doctor called back, immediately referring Kevin to an orthopaedic surgeon. Kevin was diagnosed with osteosarcoma – the same type of bone cancer Terry Fox once had. Osteosarcoma is often difficult to detect without diagnostic imaging because it rarely causes physical symptoms that make you feel unwell. It usually occurs in children and young adults under the age of 25, affecting the bones in the arms and legs. MRI’s, X-rays, bone scans and biopsies determined Kevin’s tumour was the highest grade, meaning he needed to undergo two rounds of chemotherapy to shrink the tumour before the doctor could surgically remove the affected bone and surrounding tissue. After completing his cycles of chemotherapy Kevin underwent a 14-hour surgery. The orthopaedic surgeons removed Kevin’s left humerus, part of his scapula, his entire deltoid muscle and one of his triceps and biceps. The team then removed the fibula from his left leg and put it in place of his humerus, securing it with screws and a metal plate running from his shoulder to elbow. Kevin’s chemotherapy protocol calls for four rounds of chemotherapy after the surgery in order to destroy any remaining microscopic cancer cell. He should complete his chemotherapy by the end of April, 2019. Kevin’s extensive treatment course made for many overnight inpatient stays, which exposed him and his family to the network of support at the hospital. As an outgoing teen, Kevin particularly enjoyed the Camp Oochigeas room, spending time with the nurses, social workers and camp staff. His bond with the staff grew over time, to the point where he now considers the hospital his second home, filled with people who are like extended family to him. 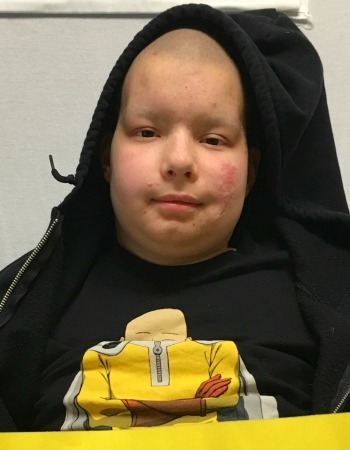 Wanting to give back, Kevin decided that the funds raised from a benefit concert held in his name would go towards buying new instruments for the Camp Ooch room in the hospital. The remainder of the money has been put towards funding patient trips to the summer camp in 2019.